I'm not promising anything, but do welcome a new part of my blog, EYE-SPY. Eye-spy will be a short post about eyeshadows that I find interesting. It may be mineral eyeshadows or traditional eyeshadows like MAC, Urban Decay. This will mainly be a 1 shadow swatch per post unless it's really necessary to post the whole palette. This may also include eyes of the day (EOTD) or simply a recoemmendation on my part. :) Hope you'll love this post. :) Oh! And you can also request a swatch of an eyeshadow you like in my collection. MPM stands for Multipurpose Mineral. You can use this in anyway you want aesthetically unless otherwise provided. Either on the usual places like the eyes, cheeks, lips or even all over the body. MPM's are very much on top of the list of mineral makeup users. I persoanlly love that this is a less expensive products with such high-intensity colors. EYE-SPY, Twilight Multipurpose Mineral Eyeshadow from Ellana Mineral Cosmetics. Twilight is a deep antique gold. 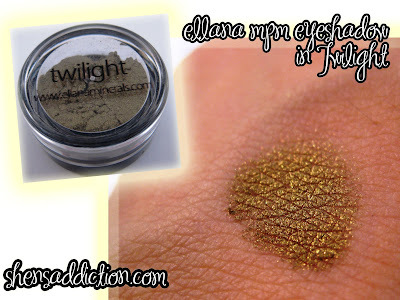 I have this theory that the formulator of this eyeshadow was inspired by the book Twilight that has been so popular lately. True that this will remind you of old tapestry designs of the old times where vampire freely roams the cobble streets. Twilight MPMinspires me to do a smokey look. Using the foiling method, I will apply Twilight all over my lid just below my crease line. Allow it to dry. Then sweep a black eyeshadow with soft glitter specks light those from The She Space or MAC Black Tied to deepen the crease for the full smokey effect. Followed by Ellana MPM in Sensational as Highlight. Blend to remove harsh lines between colors. Twilight MPM inspires me to do a smokey look. Using the foiling method, I will apply Twilight all over my lid just below my crease line. Allow it to dry. Then sweep a black eyeshadow with soft glitter specks like those from The She Space or MAC Black Tied to deepen the crease for the full smokey effect. Followed by Ellana MPM in Sensational as Highlight. Blend to remove harsh lines between colors. Can you imagine Bella in a dress this color with deep red shiny threads weaving an intricate design along her bodice?